When I am in the kitchen and and cooking or baking I am always looking for ways to build or enhance the flavors of my final dish. In baking I do this by using milk, juice or coffee in place of water called for in cake mixes, to make frosting and glazes, or to soak fresh fruit (apples covered in a reduced orange juice mixture is a refreshing and light breakfast). In cooking I do the same thing. When I cook meat in my crockpot I always use chicken broth, tomato juice, or beer (such as Fat Tire) and even root beer to ensure that my meat comes out tender and flavorful. I also like to use these same flavorful ingredients to create sauces and gravies (this technique is what makes this Shepherd’s Pie incredible). Today I bring you a vamped up southern classic. Biscuits and gravy. 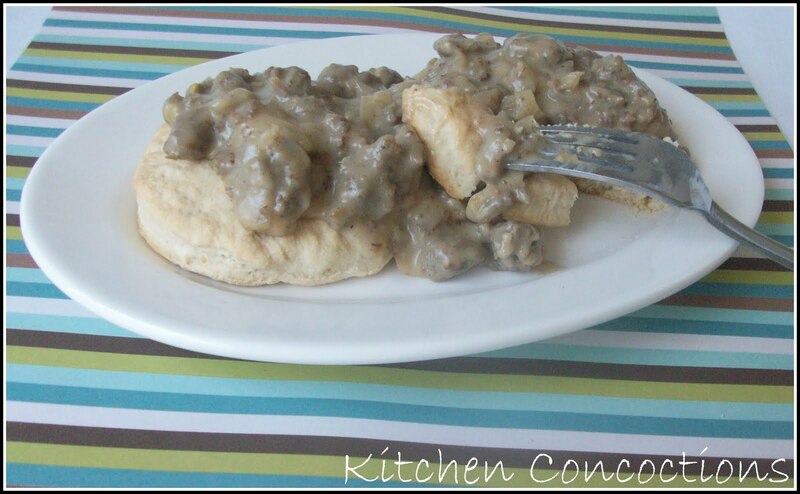 But not just any biscuits and gravy; Beer Biscuits with a Beer and Sausage Gravy. Now that’s adding a boost of flavor! Recipe Notes: You can substitute beef broth or milk in place of the beer in both recipes below. Preheat oven to 450 degrees. Spray a baking sheet with non-stick spray. Mix all ingredients together, and stir until dough forms. Dump dough onto floured surface. Fold over and kneed approximately five times. Roll dough to 1/2 an inch thick. Using two-inch circular biscuit cutter cut biscuits. Place biscuits on prepared baking sheet. Bake at 450 degrees for 8 to 10 minutes until golden brown. Heat 1/2 tablespoon of vegetable oil to a large saucepan over medium high heat. Add the sausage and break it up into small pieces. And brown. Turn the heat down to medium. Remove the sausage and drain. Add remaing vegetable oil to pan. Add onions and cook until they begin to caramelize slightly, approximately 8 minutes. Add butter to pan and let melt. Whisk in the flour and cook while whisking until the roux forms and turns a golden brown. Keep stirring and slowly pour in the beer and then milk, making sure to whisk out all the lumps. Once all the milk and beer is mixed in, return the sausage back to the skillet. Season with salt and plenty of freshly ground pepper. Simmer the gravy until thickened and serve over beer biscuits. Disclosure: This post was sponsored by FoodBuzz and New Belgium Brewing Company. Comments, opinions and recipes all my own.